Here are some facts about Dover Castle, an important stronghold in Kent, England. There is some evidence to suggest that an Iron Age fort was built on the site of Dover Castle. The remains of a Roman lighthouse can still be seen at the Dover Castle site. Following William the Conqueror’s victory over the Saxons in the Battle of Hastings, it seems likely that the Normans built a motte and bailey castle at Dover. During the reign of Henry II, many of the key features of Dover Castle were built. Inner and outer baileys were constructed along with a rectangular keep. 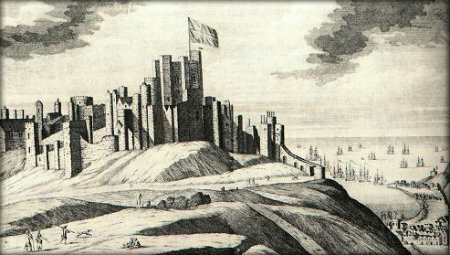 During the First Baron’s War, Louis VIII of France tried to take the castle. Although he did manage to get through the walls in some places, his attack was successfully defended. The English troops in the castle actually tunnelled out of the castle to attack the French. Henry VIII visited Dover Castle during his reign and he upgraded the defences. In the late 18th century, during the Napoleonic Wars, Dover Castle’s defences were upgraded again. More gun positions and platforms were added, and the roof of the keep was removed so that heavy artillery could be used from the top of the keep. Canon’s Gateway linked Dover Castle’s defences to the defences of Dover town. A series of tunnels were constructed as a garrison for troops during the Napoleonic Wars. About 2000 used the underground barracks. During World War 2, the tunnels were used as air-raid shelters and then as a secret command centre and military hospital. There are over three miles of tunnels, and many parts of the underground system have not yet been fully explored. Dover Castle is owned by English Heritage and it attracts more than 300,000 visitors every year. Click this link to discover more facts and information about castles. I love this website thank you I’ve got all the information I need!!! helped me so much for my castle prodject homework for school! thanks!